A snug Woodford County village is reeling with anguish after an explosive fire claimed the lives of five people, three of them little children. 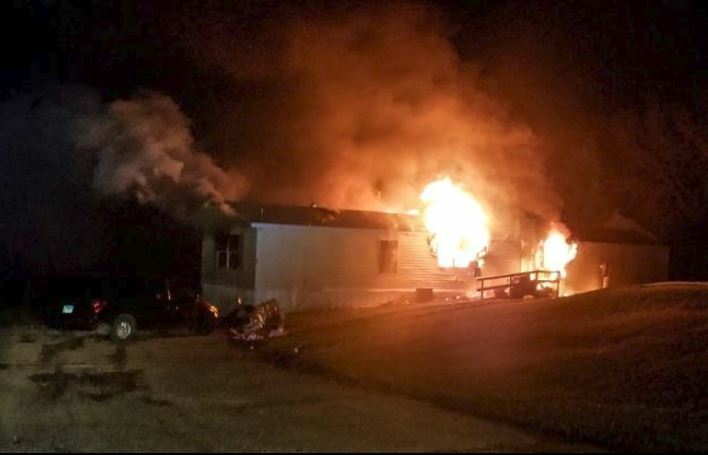 At 11:19 p.m. on April 6, Eureka-Goodfield Fire District responders were called to a raging mobile home fire at 14 Cypress Court in Timberline Estates in Goodfield. Five minutes before midnight, Woodford County Coroner Tim Ruestman pronounced the victims dead at the scene. 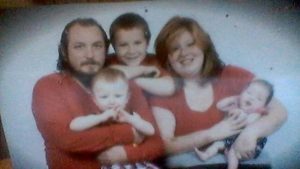 An autopsy concluded that Kathryn Murray, 69, Jason Wall, 34, Rose Alwood, 2, Damien Wall, 2, and Ariel Wall, 1, all succumbed to carbon monoxide intoxication caused by smoke inhalation. Jason Wall’s fiancée, Katrina Alwood, and their son Kyle, 9, escaped the fire and were transported to OSF Saint Francis Medical Center in Peoria, where they were treated and released. Damien and Ariel were also the couple’s children. Rose was Katrina’s niece, and Kathryn was her grandmother. According to Timberline Estates manager Shawn Johnson, a neighboring relative tried desperately to help, but could not, due to the intense heat. Johnson was first to arrive at the blaze, and said the area that encompassed the living room was completely engulfed in flames. He bolted around the home, only to find a more tragic scene; at least three-fourths of the trailer was on fire. Anna Marie Siebert was sleeping when her son woke her as he was calling 911. Siebert, who often watched the couple’s children play outside, ran to the burning home with her son and husband, hoping to help. After a sleepless night, Siebert gathered with neighbors the next morning to grieve the deaths and view the tragic aftermath. Sections of siding drooped from the outside walls of the charred shell, and blue tarps covered the gutted midsection. Furniture, toys and insulation lay strewn about the lawn behind bright orange plastic safety fencing. It was a fire, Siebert said, that was punctuated by explosions and bursts of what sounded like gunshot blasts. The fire remains under investigation by the Woodford County sheriff’s and coroner’s departments, the Illinois State Police and the Illinois Fire Marshall. 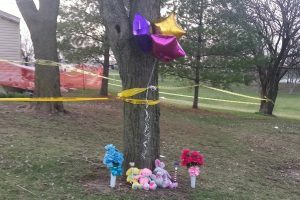 In the meantime, sympathetic family and community members have launched fundraisers to help with costly burial expenses and other needs. Amanda Byer, Kyle’s aunt, launched a Facebook fundraiser for Kyle and Katie at www.facebook.com/donate/449684585767408/. Eureka resident Jeremy Aguirre started a GoFundMe page under Goodfield Family Mobile Home Fire. 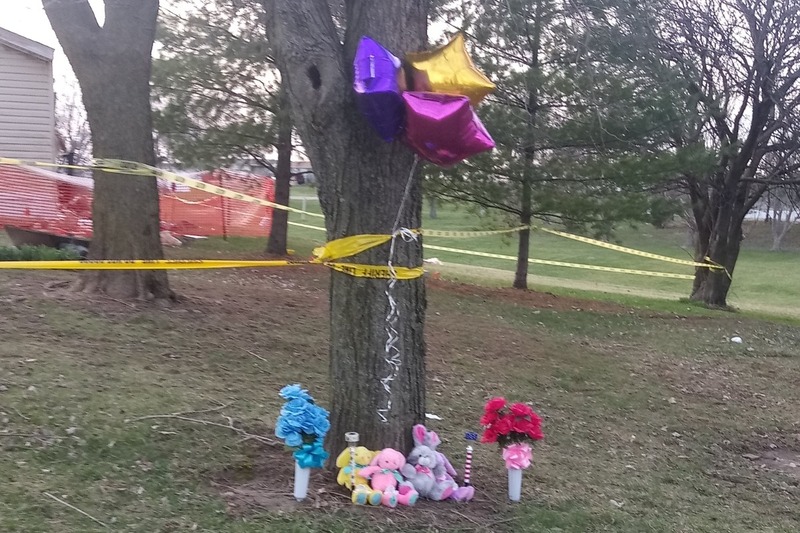 “We have spoken with family members, and they are not sure of how they are going to lay these 3 precious lives of little ones to rest, as well as the adults,” Aguirre wrote below a photo of bunnies, balloons and flowers resting by a tree in the victim’s yard.